Overall Vehicle (L x W x H): 122.5" x 65" x 76"
Cargo Bed Dimensions (L x W x H): 37" x 48" 11"
Sector 1000 First Side by Side owned. No prior experience. Wow - Massive torque. Seems to handle everything I have used it for with ease. It is a little jumpy in low. Not a smooth start. Adjusting gear shift selector helped. It needs to be dead on the letters. I have hauled dirt and dumped, landed boat Tyee 5.3 on beach no ramp. Pulled trailers, trees, stumps, winch works well, runs and operates good with no problems so far. Handles very well. It is a brute. Purchased May of 2016 50 hours / 140 miles on it as of August 2016. 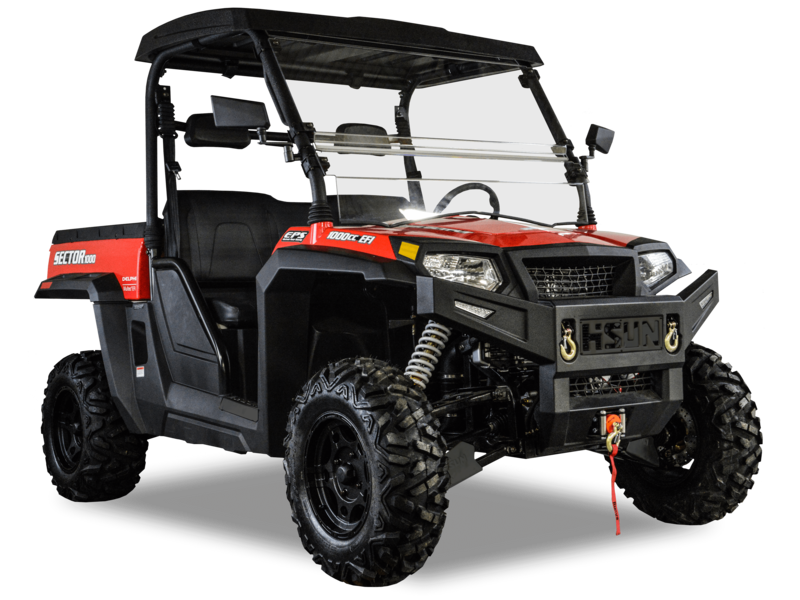 Sector/Outfitter 1000 I purchased this from Cabela's and it is called an Outfitter 1000, not even the dealership knew that Hisun had changed the name. It is a brute and a bit touchy in reverse. Shifting was difficult at the beginning, but after nearly 50 miles of backwoods driving, the shifting is getting smoother. Driving in Northern Louisiana and the back bayous, the 4x4 is more than what the muck and mire could throw at it. I recommend getting a heavy duty "yank strap" for the tow line. I came upon a fallen tree blocking the trail and no easy way to back away. The UTV and wench didn't hesitate pulling this behemoth out of the way. Guys at Deer Camp are all jealous about the guts and speed of this UTV and are Camo Green with envy. I would give 5 stars but the rubber bushings that hold the bench seat in place were soaked with axle grease and had deteriorated so bad they wouldn't hold and I almost lost the seat while trailering. The biggest question is "Why are there no drink holders?" I've emailed Customer Service in hopes that they replace the rubber bushings. If they do, I will re-evaluate my rating.